I was born and raised in Los Angeles all of my life. I jokingly refer to my neighborhood as “pre-gentrified Echo Park,” but it’s true. It’s such a different place now. I grew up in a community of Southeast Asians and Latinos. I lived in a complex where the other three units were Cambodian families; one by one, they left for the suburbs or affordable housing or better opportunities. At one point, most of my family members (from both sides) lived within walking distance of my home. But they all left and it was eventually just my family. Where are your parents from? When and how did they leave Southeast Asia and arrive in the United States? My mom is from Cambodia and my dad is from Vietnam. They both arrived in the early 1980s to America, both sponsored by family members. My dad told me he biked across Cambodia, stayed in Khao-I-Dang (refugee camp), and flew in an airplane. My mom fled with her family to Thailand, literally crossing the fence to Khao-I-Dang on their hands and knees. They were disguising themselves as four-legged animals to avoid being recognized as humans and risk being shot. They were later transferred to a refugee camp in Bataan, in the Philippines, before being sponsored to Utah. Did your parents ever talk about their experiences of being refugees? What was said, or not said? What was your reaction when you found out? What is your reaction now? As a child, I grew up hearing stories about the Cambodian genocide from my mom, which is such a rare experience in retrospect. I have never met anyone else whose parents were so candid about their lived experiences under Pol Pot. I don’t remember my reaction because I had been so accustomed to these stories from an early age. But I was far from being jaded or uninterested. Her storytelling ignited an interest in me to read and learn more about my mom’s experiences. By the age of 10, I found myself engrossed in Haing Ngor’s autobiography and watching “The Killing Fields.” I could not believe the horror of the Pol Pot regime and it both inspired me to actively share my knowledge and gave me a true glimpse into the world that my parents were coming from. It was, of course, so deeply saddening. Every time I talk to my mom, I learn more details and continue to be amazed by her resilience. I would be lying if I didn’t say that some of her stories are very haunting and undoubtedly traumatic for her. A class project documenting my mom's family, many who did not survive the Cambodian genocide. When you hear the term “Southeast Asian,” what words or images emerge? “Southeast Asian” invokes two meanings for me: the first being a geographical or cultural identity that encompasses communities from countries, such as Thailand, Singapore, the Philippines, Indonesia, and Malaysia (besides Cambodia, Laos and Vietnam). The second definition is one of political implications, referring to the Southeast Asian refugees who fought, struggled, or fled during the time of the Vietnam War – and includes Hmongs, Cambodians, Laotians, and Vietnamese people. Is there a typical “Southeast Asian American experience?” Are there any stereotypes you have heard or have had to face being Southeast Asian/Asian American? How would you define the “Model Minority Myth?” Has it played a role in your own life? The “Model Minority Myth” is probably my biggest gripe. I don’t know if there’s a typical Southeast Asian American experience. Looking at my extended family, there is such a disparity in our experiences: I have a cousin who had joined a gang and spent time in prison, another who cooks for Michelin-starred restaurants in New York, and another who went to Stanford. Stereotypes about being really smart actually do more damage than good. There are so many implications about “being smart” – such as being uncool, unoriginal, and nerdy – that are so untrue. And it really hurts people who may actually need the academic assistance and extra tutoring, but this myth can overshadow these students. Similarly, believing all Asians are economically successful ignores the fact that there are Asian communities that are living in poverty. It helps no one. My sister and I are both wearing an áo dài, traditional Vietnamese attire. 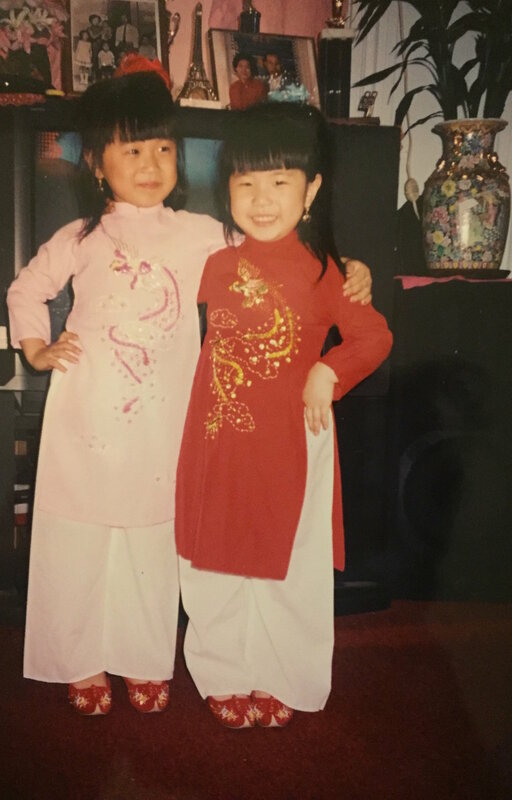 What was it like for you growing up Southeast Asian American? In what ways do your parents or your culture shape your identity? What languages do you speak or understand? Growing up in pre-gentrification Echo Park, in the early 1990s, was a kind of “ignorance is bliss” state of being. My overprotective parents – especially my mom, who witnessed the worst in humanity – did not let me venture out very much. I was usually confined to my home and indoor activities. But I absolutely loved the presence of my family. When I was born, I lived in a two-bedroom rent-stabilized home that would now be characterized as overcrowding. Besides my family of four, my household included my grandparents, aunt and two uncles, my cousin from Utah, and an occasional distant relative. There were also the occasional kids my grandma would watch. Next door was my dad’s side of the family (they later moved a block away) and behind our house, was my dad’s older brother’s family. This intergenerational dynamic – in all of its overcrowdedness and noise – with my extended family created an atmosphere that felt distinctly immigrant and Southeast Asian. I was exposed to the languages and culture that marked being Cambodian, Chinese, and Vietnamese. It was this blending that fostered a love for my people’s food and the notion that they weren’t distinct countries with distinct cultures. It was all one to me. Growing up in a multicultural Southeast Asian household should have prepared me for a future that was multilingual. But it did not. My therapist suggested that all of the languages, and the constant switching between them, led me to disavow them. That, and my immersion in books all of the time, perhaps led to my English degree. Perhaps my biggest internal strife is not being able to speak all of the languages I was surrounded by. I think classes that focus on the diverse experiences of a community, culture, or country can be life-changing. History textbooks often ended at the Vietnam War, with a very American spin on the entire thing. My high school had a Mexican American/Chicano history class, which I thought was amazing given that I went to school in Boyle Heights and the vast majority of residents are Latino. I think it’s important to have Asian American Studies courses, but even then, it’s also important for people of all and any backgrounds to take these classes (not just Asian American students). In college, I had enrolled in the first-ever class at UCLA on the Cambodian American experience but ended dropping it because 1) I couldn’t balance all of my classes and I didn’t need the class for credit and 2) I wasn’t sure that it would stretch my mind in many directions. I was familiar the narrative, the struggle, and as a very proud Cambodian – the community. It’s just as important to have tangential classes focused on marginalized communities. While in high school, I took an anthropology class that ended up focusing on the history of race and racism and its manifestation on today’s society. That opened my eyes. Throughout college, I took a variety of classes around education, immigration, urban planning, Asian American Studies, Chicano Studies, and African American Studies. Taking the variety of classes that I did gave me this sense of shared experiences and values, but also allowed me to value the unique experiences of others very different from me. Being the Cambodian flag-bearer at the UCLA graduation. Mainstream media has often been criticized for its lack of or trivialized portrayal of Asians and Asian Americans. What do you think? Who was the first Asian or Asian American actor or media personality you remember seeing on TV or in the movies? Who are your favorite Asian or Asian American actors? Can you name any Southeast Asian actors? The f*cked-up portrayal of Asians and Asian Americans can be traced to Dragon Lady and Fu Manchu, so I think societally, we’re really progressing. I grew up watching Trini from the Mighty Morphin Power Rangers and reading about Claudia Kishi’s character from The Baby-Sitters Club. My consumption of media and books skews heavily toward white characters and to this day, I find myself extra-sensitive when I see an Asian male character be emasculated or someone be represented as a fob. It just highlights our foreignness and un-belonging.